Disclosure: I am proud to be a Hatchery Brand Ambassador! I was not compensated for this post, however I did receive sample products for my review. All opinions are my own and not influenced in any way. After a summer long obsession with fruit pies, apple pie was a natural progression as the fall season arrived. I seem to remember making an apple pie just about every Thanksgiving spent here with my family. It's the traditional thing to do, along with pumpkin pie and sweet potato pie. I don't know that I ever put a lot of thought into perfecting any particular recipe though, so my success was hit or miss. Not to say I've really ever made a terrible apple pie, but now that I think about it, none were exactly memorable. I wanted to change that this year, and my inspiration came in the form of a beautiful bottle of maple syrup from my Hatchery subscription box. Ever since getting my sample of Bobo's Mountain Sugar and subsequently ordering a full size bottle, I have been enamored with this stuff. I'm talking maple syrup in everything, from my country gravy to my salmon. 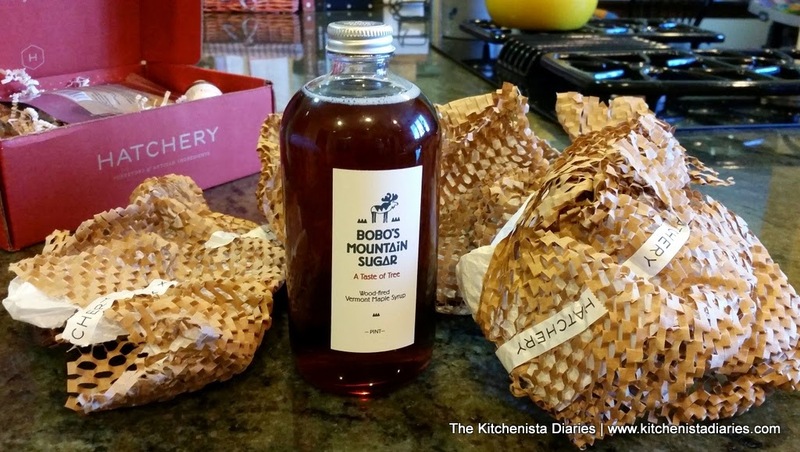 When I tasted Bobo's Mountain Sugar, it dawned on me that I have been cheating myself out of the good stuff. It is classified as Dark Robust (formerly known as "Grade B") to be precise, and let me tell you - it's so rich and pure that you'll never waste your money on the lighter syrups again. This was what I needed that would finally get me excited about cooking with maple syrup, and jazzing up my apple pies. I think that's what I'm growing to love about getting my Hatchery boxes in the mail. Each month you get introduced to a handful of new ingredients that you'd probably never think to try yourself. You never know what might light that creative spark to help you come up with something great in the kitchen! 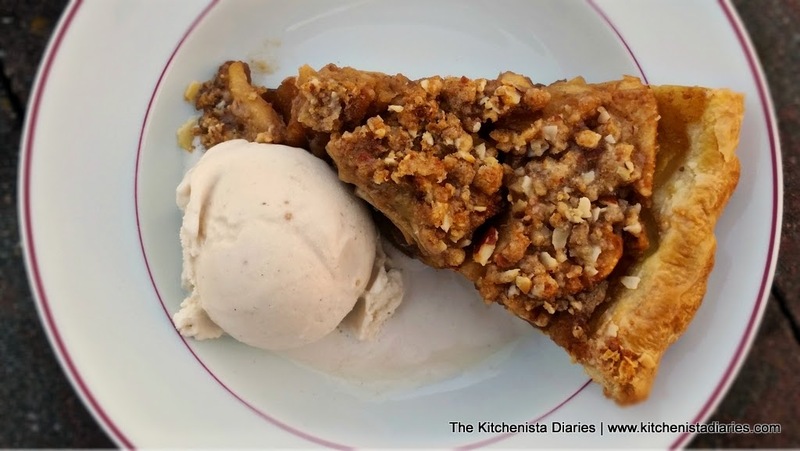 There were a few things I wanted to accomplish in developing an apple pie recipe - a crisp flaky crust, warm spices with a maple undertone, and a tender apple filling that sets up firmly for slicing. I knew the crust wasn't going to be a problem - I stuck to my regular recipe for deep dish pies. For the apples, Honeycrisps were an easy choice. They're on the expensive side, but my favorite for cooking by a longshot. 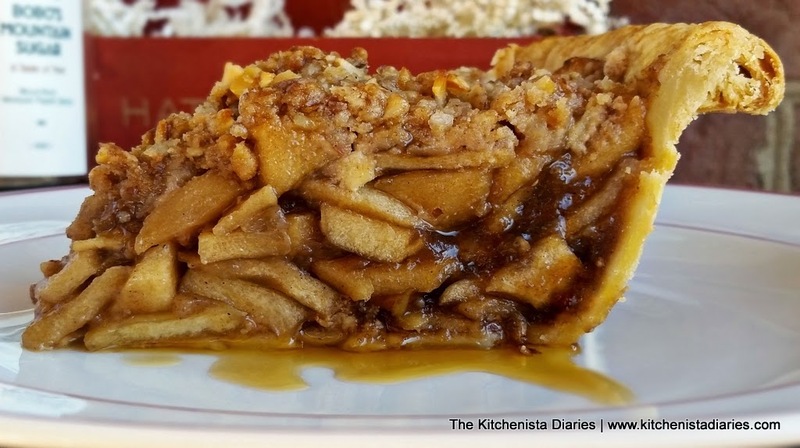 If you want to play around with other types of apples, aim for a mix of sweet and tart that stay firm when baked. 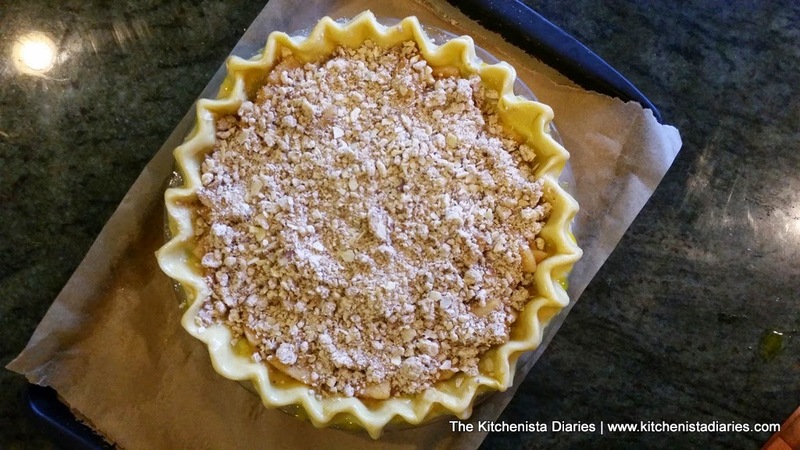 In a time crunch I ended up foregoing the traditional lattice crust for a crumble topping and never looked back. The texture contrast was wonderful and it's so much easier (and economical) not to use two rounds of pie dough for one pie. I sprinkle crushed almonds over the crusts of my fruit galettes to help keep the bottom crisp, so I applied the same trick here in the apple pie. After that it just made sense to continue with the almonds as a flavor element, so I added a little almond extract and crushed almonds for my crumble topping. A pie was born. It took a few tweaks to get the topping right and play around with the thickeners (I ended up opting for half cornstarch, half tapioca) but this was a pie that was delicious from the very beginning and only got better as I tested the recipe! If you're going through the trouble of making an apple pie from scratch, you'll really benefit from a fresh spice blend too! 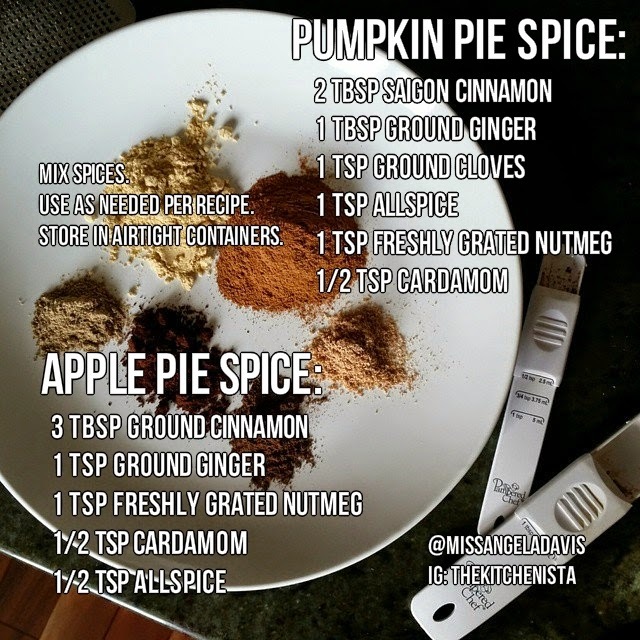 Here's my cheat sheet to my two holiday blends that will get you through the fall and winter cooking seasons. The pie shell is the first thing you'll want to knock out of the way, if you don't already have one prepared (because you followed my Thanksgiving tips, of course.) After rolling out the dough and placing it in the pie plate, trim any excess more than an inch or so. Tuck the edges under before crimping or whatever decorative touch you like to make. My crust recipe puffs up considerably in the oven, so I don't get too fancy with intricate details. Always keep your dough cold, so if it starts to warm up on you too much and you feel the butter melting, slide it onto a baking sheet and freeze for a few minutes until it firms back up. When you're done forming the crust, pop it back in the freezer until you need it. 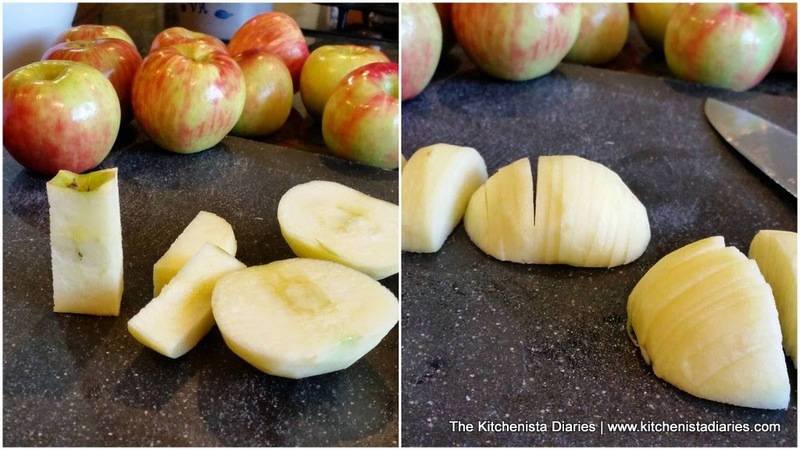 To prep the apples, peel and then slice off the sides leaving the core behind. Thinly slice by the 1/4" and then chop the slices in half. 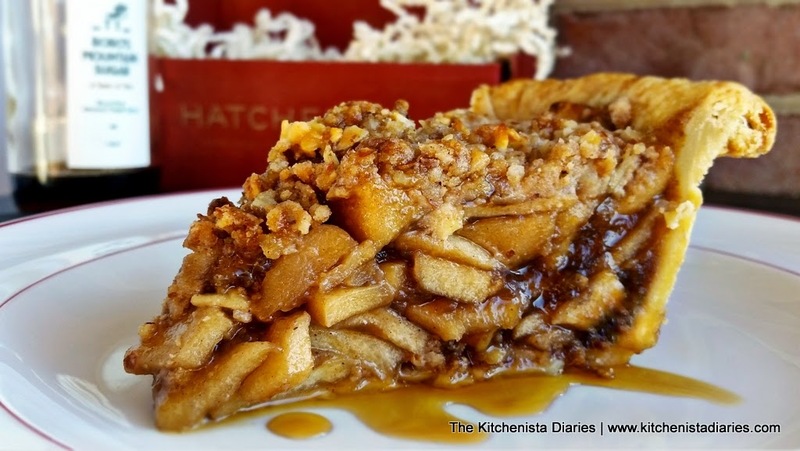 I found that the smaller chunks of thin apple slices filled the pie better than bigger wedges, which left gaps around the edges of the pie shell. Here's a trick I learned from Serious Eats in order to easily precook your apple slices so they get soft enough when the pie bakes. Just pour boiling water over all of the slices, and let it sit for ten minutes. I use that time to continue prepping some other ingredients. 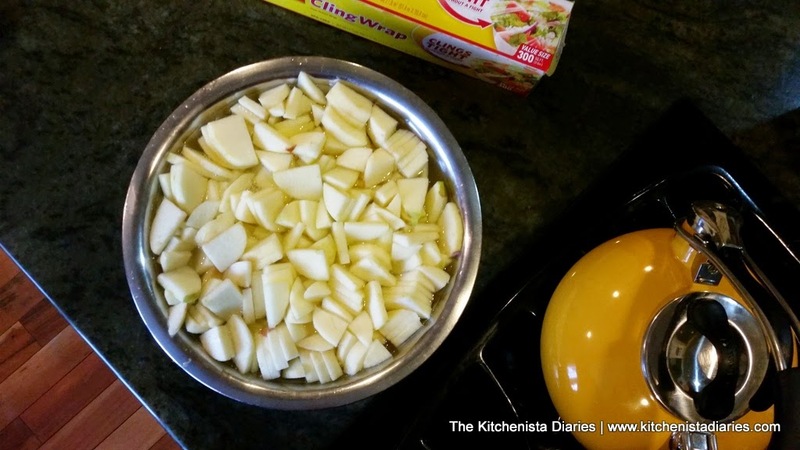 After 10 minutes, transfer the apples to a colander and let them drain for at least ten minutes to dry out, tossing occasionally. Meanwhile, prepare the tapioca by running it through your grinder until the granules are finer. I use this so often for pie baking now that I just do one big batch and store it in a little jar. If you have your grinder out, you can use it to crush the 1/4 cup of almonds, otherwise just put them in a plastic bag and roll over it with your rolling pin until the almonds are crushed. 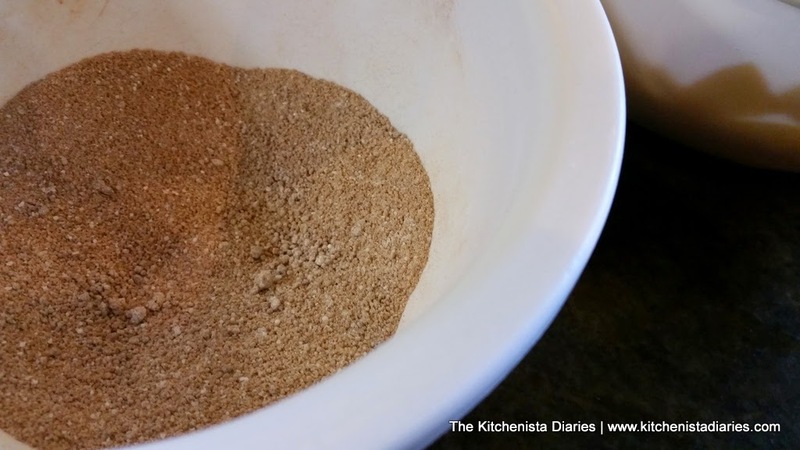 Stir together the ground tapioca, cornstarch, brown sugar, apple pie spice and salt. 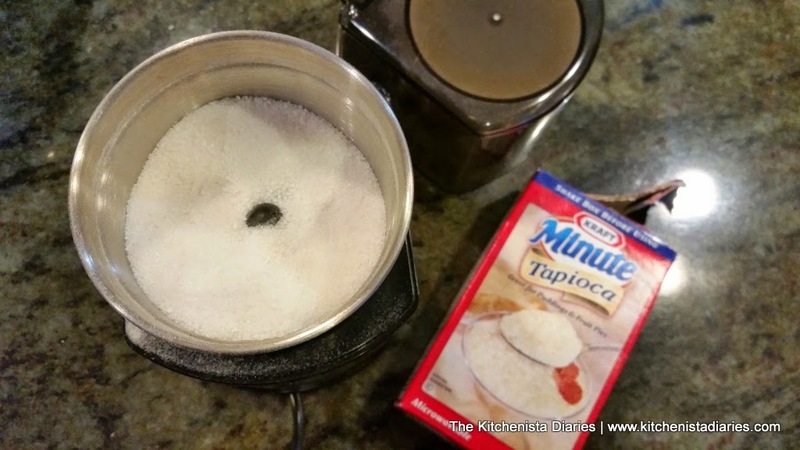 This helps the tapioca to disperse evenly instead of clumping up all in one place. Note, this isn't a super sweet pie. Feel free to adjust the sugar content to your preference especially if using a different apple variety; Honeycrisps are pretty sweet on their own. 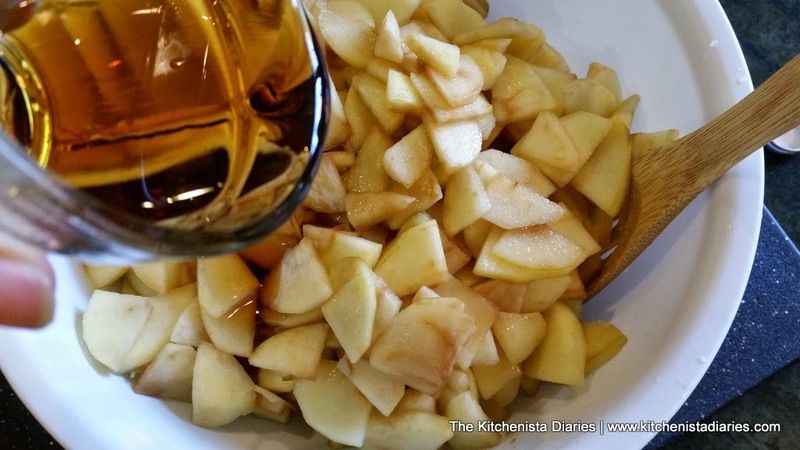 Transfer the apples back to a large bowl and toss with the apple cider vinegar, vanilla extract, almond extract, and maple syrup. 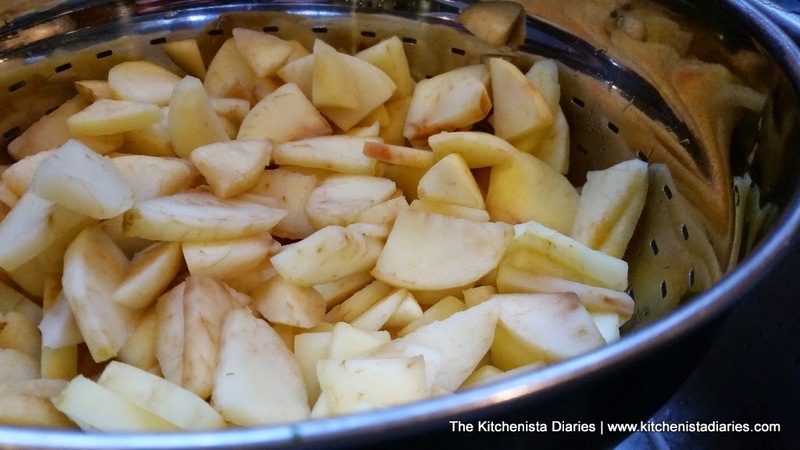 Then toss with the sugar mixture so the apples are evenly coated. 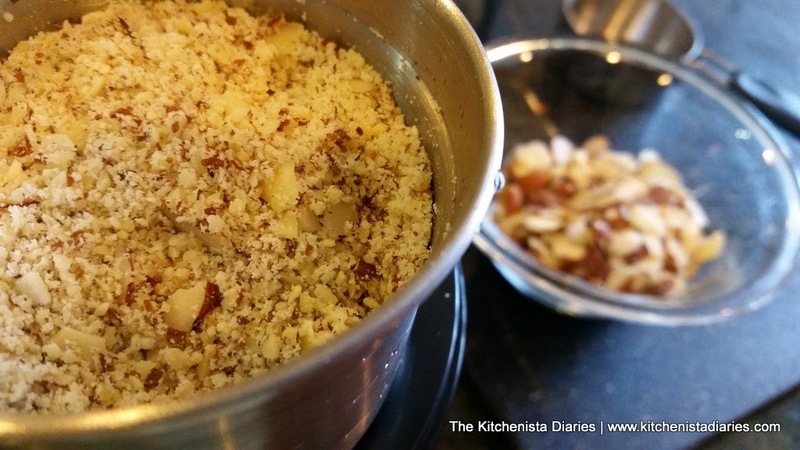 The last thing to prepare is the almond crumble topping. 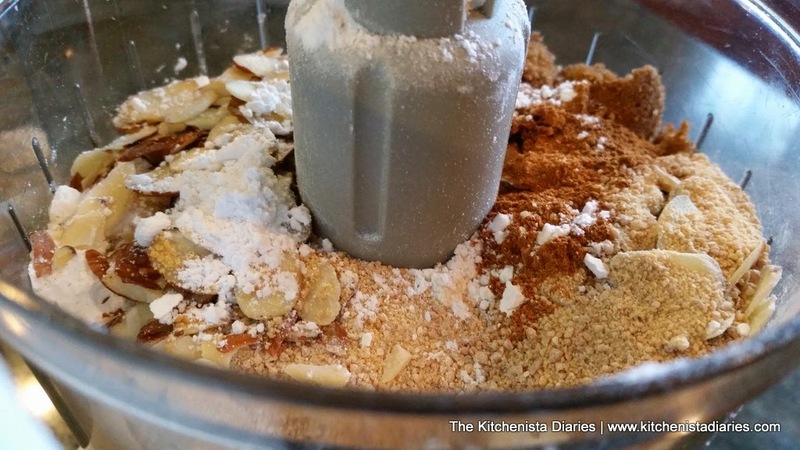 Combine the flour, maple sugar, sliced almonds, salt and apple pie spice in your food processor. 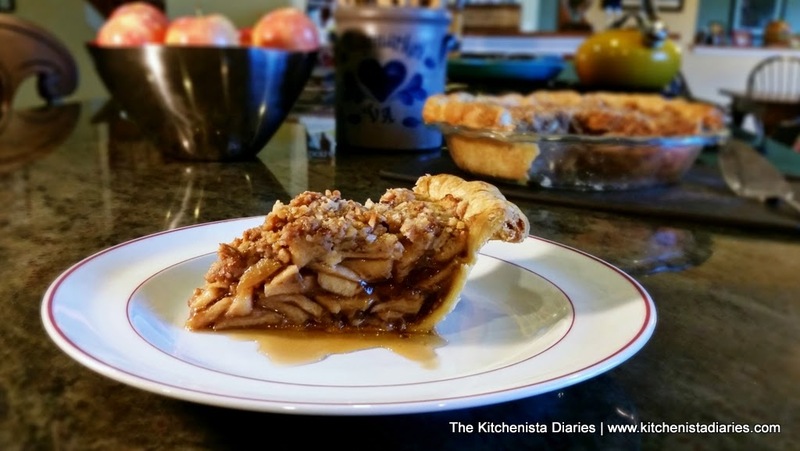 I wrote the recipe using maple sugar which really just brings home the maple flavor of the pie filling. It's simply pure maple sugar that's dried into granules and would be located in the baking section of your grocery store. If you can't find it, brown sugar is just fine. 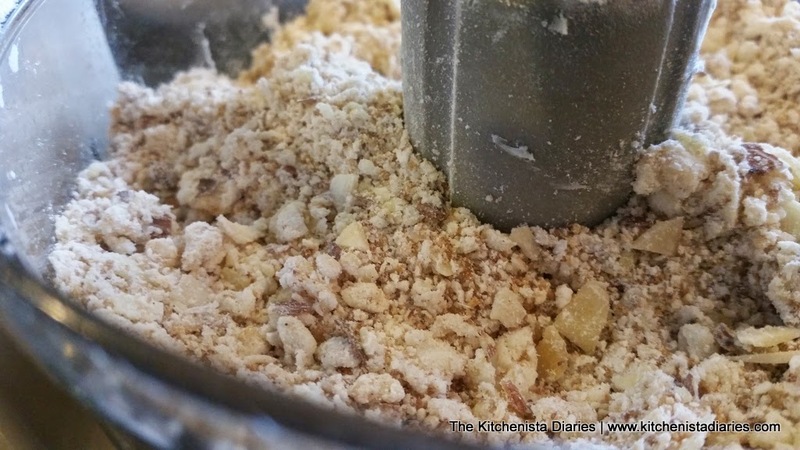 Pulse a few times until everything is combined and the almonds are crushed, then add the diced butter. Pulse a few more times until the mixture is pebbly. 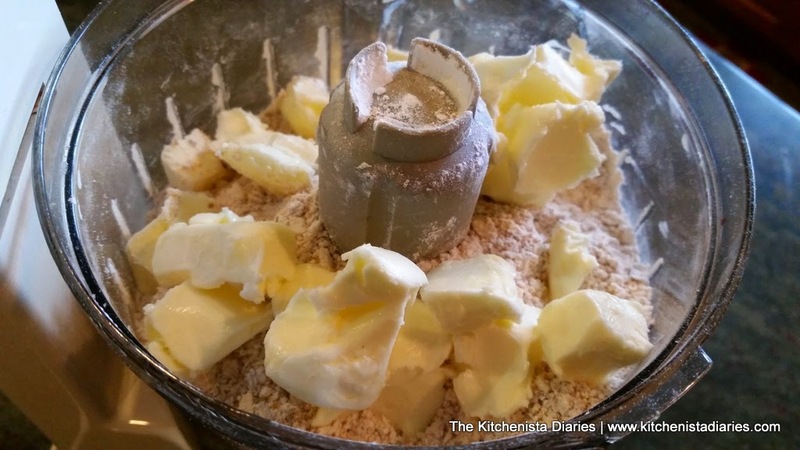 If you're prepping this in advance of baking your pie, you can store it in the freezer until needed. 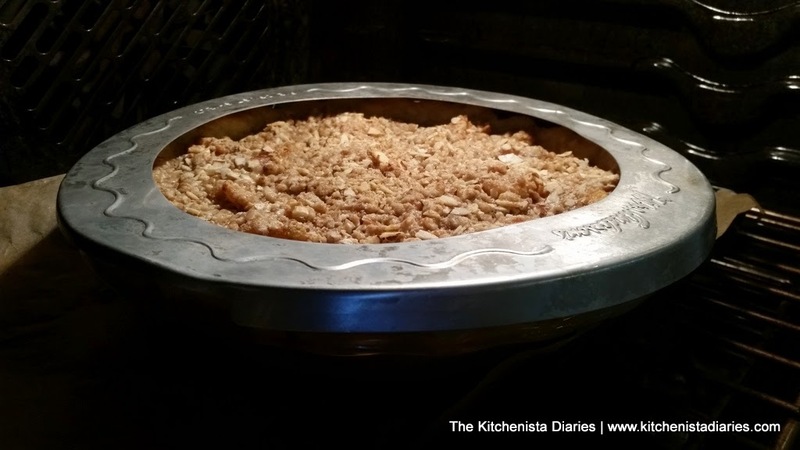 Sometimes I have a little more than I want for my pie, so I freeze and save for a quick fruit crumble another time. Preheat your oven to 425° F and arrange a rack on the lower third of the oven. 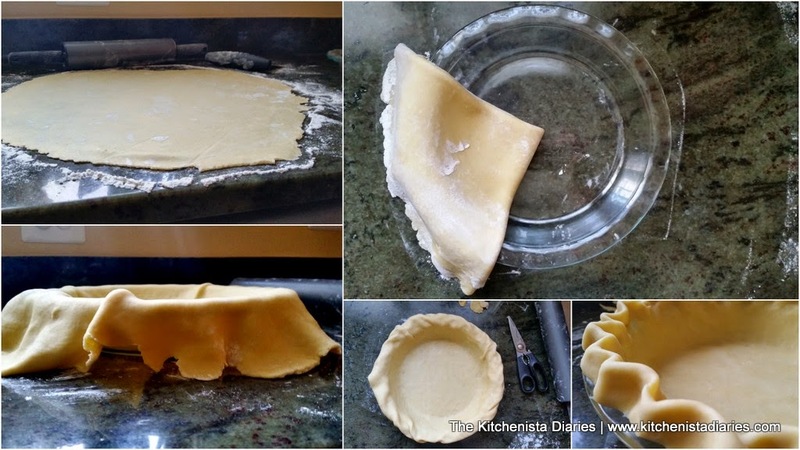 Place your pie shell onto a heavy baking sheet lined with parchment paper to catch any drips as it bakes. 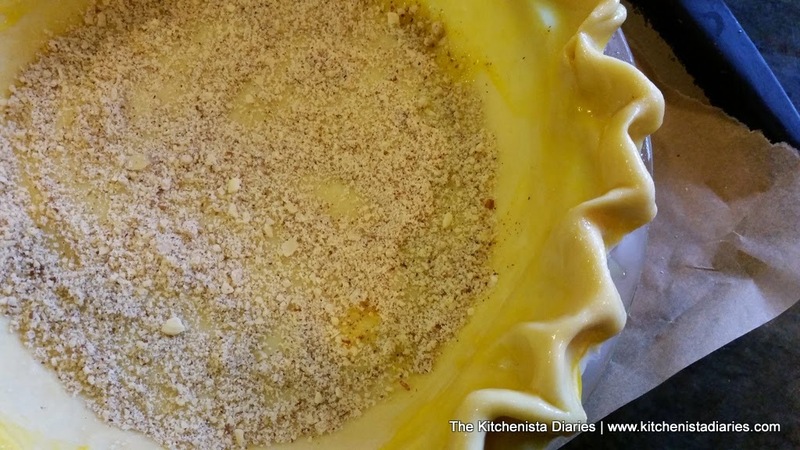 Using a pastry brush, brush the entire rim of the pie crust with egg wash. It'll give the crust a nice golden brown color when it bakes. 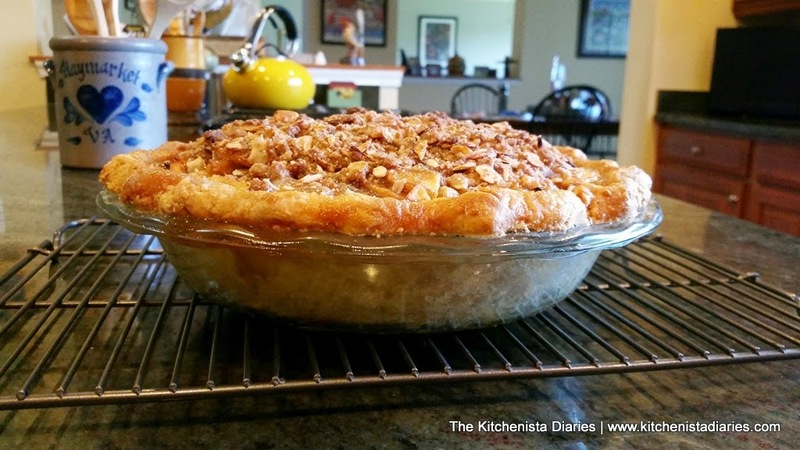 Spread the 1/4 cup crushed almonds all over the bottom of the crust. 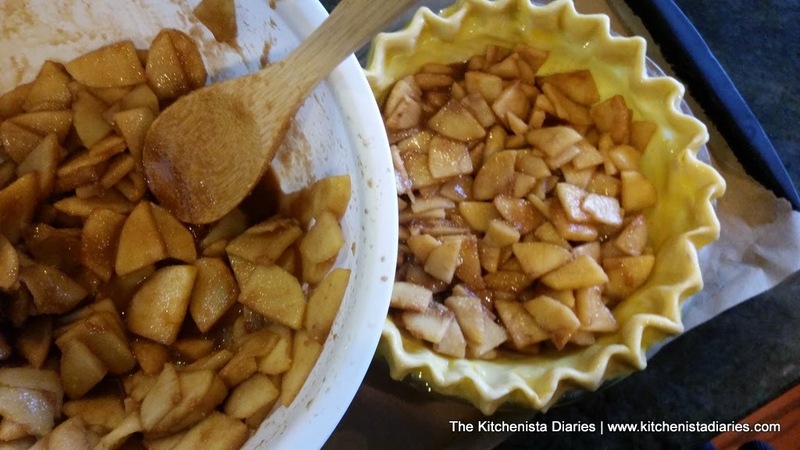 Then pour the apple filling into the pie shell, spreading the apples out as evenly as you can. 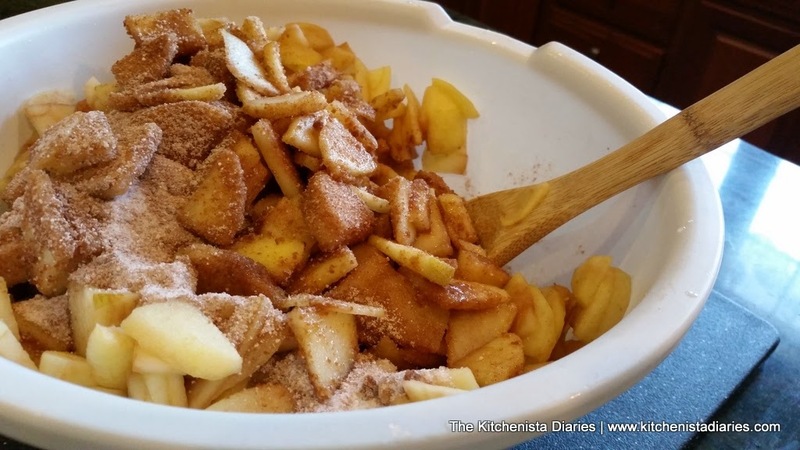 I usually have about 1/2 cup liquid or so that pooled into the bowl, and I just pour it over the apples once the pie is filled. It's mostly maple syrup so don't let it go to waste. Top the pie with the almond crumble, packing it down gently so that you can pile on a generous layer. Slide the pie into the oven, and bake at 425° F for the first 15 minutes. The crust will start to puff up nicely and get golden. If you have a pie shield, now's a good time to use it to prevent the crust from browning too much. Otherwise, you can drape the crust with aluminum foil. Turn the heat down to 350°F. Bake for another 45 minutes or until the filling is bubbly around the edges and the crust is golden brown. The good thing about using glass pie plates is that you can see how well the crust cooked around the sides and bottom. Cool the pie completely for at least 4 hours at room temperature before slicing; this helps the thickeners to do their magic. Serve the apple pie at room temperature, chilled, or warmed up a bit. I liked it drizzled with a little extra maple syrup! This pie was divine. 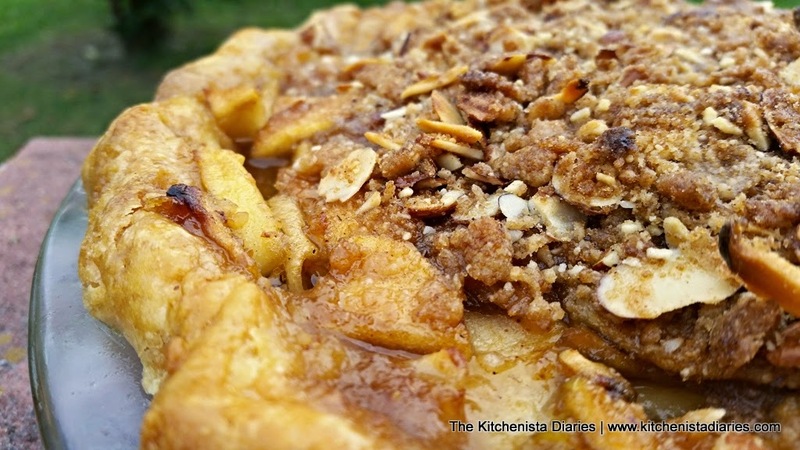 It had all the elements of a classic apple pie, but a beautiful crust, maple syrup running through the filling and the crunchy bits of almond really made it memorable. 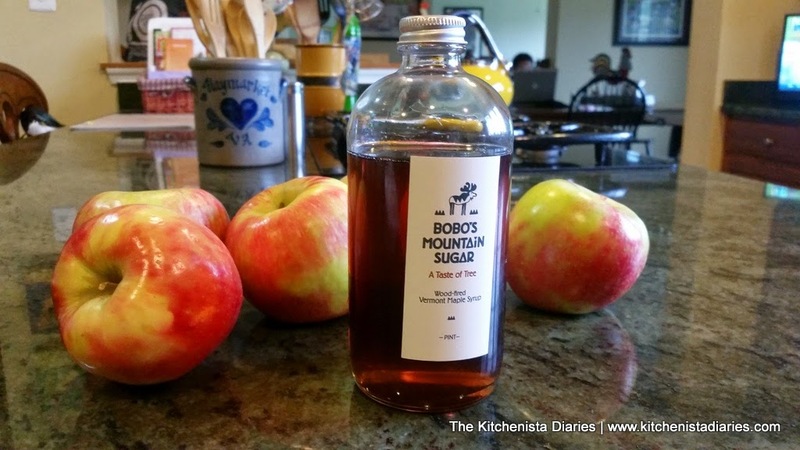 I would like to thank the folks at Hatchery again for sending me a bottle of Bobo's Mountain Sugar to use in my recipes! 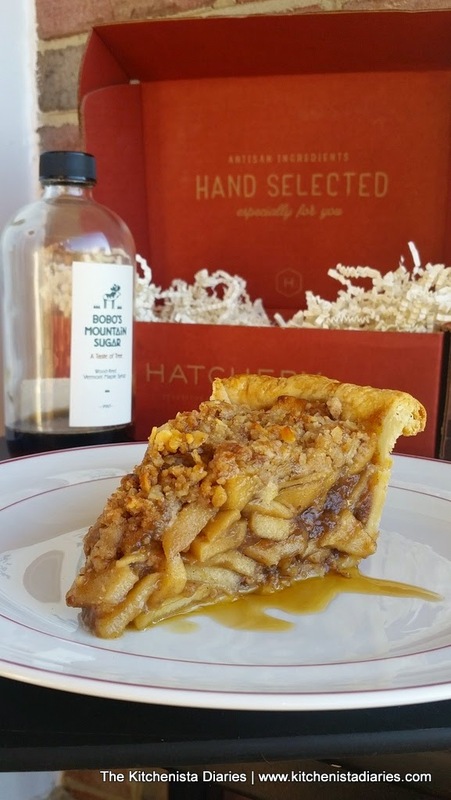 And to my readers, a Hatchery box subscription would make the perfect holiday gift for the cook in your life - check their site for great discounts on boxes as well as all of the full size products in the marketplace. I would really appreciate a printer friendly view. I don't like to have my laptop open in the messy kitchen, and the phone is too small. All the pix in among the directions are pretty and helpful as I'm reading the recipe, but not as I'm making the recipe.